McDonough, Hawkins & Company started life as Hawkins & Company, founded by Leo Hawkins in 1969. Leo was based in Prospect Hill in Galway and was joined in 1972 by Clem Desmond. Owen McDonough joined the practice in 1976 and his brother, Conor, followed him into the practice in 1978. The firm moved into the Colonial Buildings on Eglinton Street in 1981. In 1985, the expanding firm moved again to its present location of the Pro-Cathedral Building in Lower Abbeygate Street. The Pro-Cathedral Building was built in 1816 and is one of Galway’s most beautiful buildings. It still retains many of the original cut-stone ornaments, although some were badly damaged in the “Night of the Big Wind”. Part of its history in its heyday as a church includes a tragic incident on Christmas Day, 1842, when someone heard a creaking noise in the upstairs gallery and assumed it was going to collapse. In the chaos that ensued, 37 people were killed, mostly by being crushed. Happily though, times have changed in building regulations and the building is now as safe as could be. Needless to say, nobody has reported any creaking noises since. 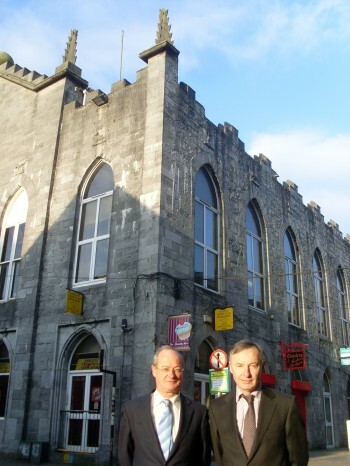 Leo was appointed as a lecturer in accountancy in University College Galway, but both he and Clem retained their partnership in the firm until 2005, when they retired. Owen, who is from Castlebar, went to St. Jarlath’s in Tuam, followed by college in Galway. He started his professional career with Purtill & Co. in Dublin before working with Craig Gardner (PWC) and spending five years working in industry for General Electric and Clark’s Shoes. He returned to Galway city with his wife, Breda, in 1976 to raise his family in Knocknacarra and continue his career. Today, Owen is a sole practitioner with a staff of ten. His career has included such highlights as being Chairman of the Western Society of Chartered Accountants in 1988, the centenary year of the Institute, and being the first practice in Galway to buy a computer – a Wang computer bought in 1978, which was the size of a large desk and cost £13,500, the equivalent of more than half an average house! Hardware costs these days are a lot less, but the firm gained valuable experience from its first foray into the world of information technology. On a more personal level, Owen’s footballing days with St. Jarlath’s have long since given way to the fairways of the golf course. He retains a keen interest in all sports, from managing the Salthill/Knocknacarra Ladies Football team to co-ordinating the Connacht West Alliance of the region’s best golfers. Conor, who lives in Castlebar, is also a keen golfer and is a well-known member in Castlebar golf club like his parents before him, having represented it in a number of competitions. Conor joined the firm in 1978 and is in charge of training and management within the practice.